Is there anything nicer than being in nature on a sunny spring day? 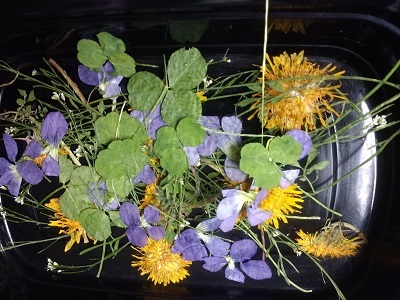 A couple of weeks ago when the flowers were just starting to really bloom, Little M. and I picked a whole bunch: bright yellow dandelions, vibrant purple violets, deep green clover leaves, and tiny white weedy flowers that I'm not certain of the species. 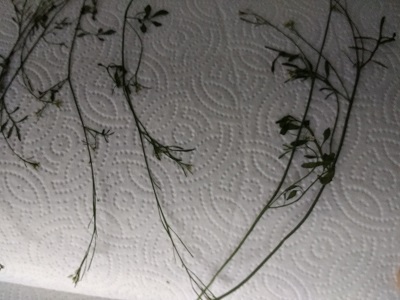 I didn't want to simply put them in a vase to wilt (anyway, we already had carnations and broccoli flowers in a water on the dining room table), so I suggested to Little M. that we could dry them and use them for an art activity. She enthusiastically agreed with the idea. 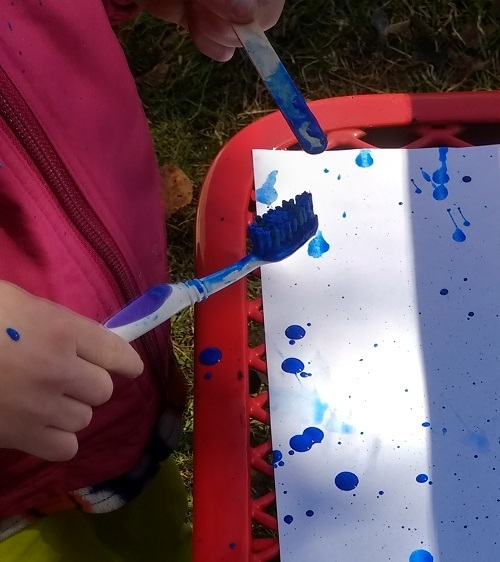 This activity, will give your child the opportunity to experience nature (both while they are picking the flowers and again when they are making their artwork) and create a fun easy piece of artwork. 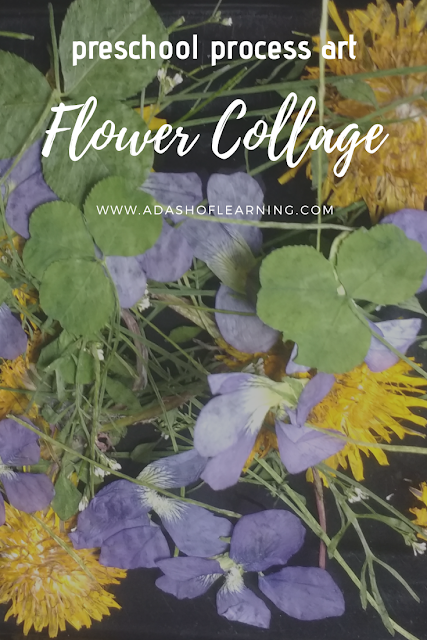 Keep reading for instructions on making the pressed flowers, and how to make an invitation for your child to make a collage with them. Open up one of the books. Place two paper towels on either side of the book, so that the pages are covered. With your child, arrange the flowers on one of the paper towels. Do not allow them to overlap. Close the book, so that the flowers are in between the two paper towels. Place more heavy books on top of the book with the flowers. Let them sit undisturbed for 1-2 weeks. 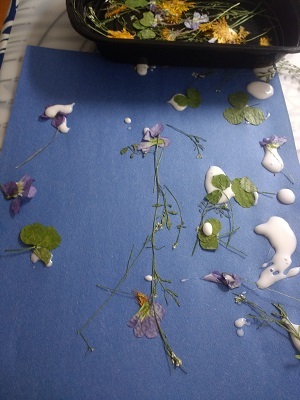 Need a book about flowers to go with this activity? 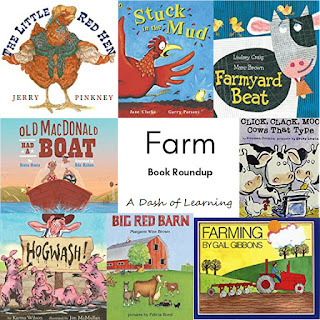 Check out our roundup of books about flowers! All you have to do for this simple process art activity, is to lay out the materials. The directions are contained within the materials themselves. 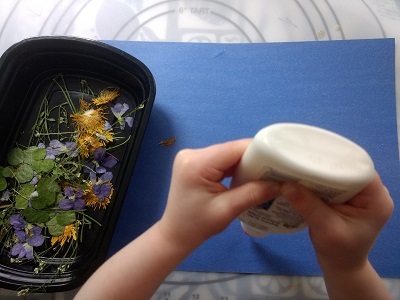 Let your child cover the paper in glue, press the flowers into the little droplets of glue, paint the paper with glue using the flower as a paintbrush, or whatever strikes their creative fancy! If you enjoyed this collage activity, check out our other process art activities. Thank you for reading about our flower collage today. If you found this activity useful, please share or leave a comment below. I'd love to hear from you! 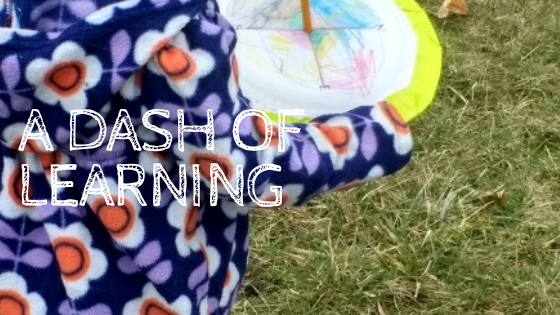 Do you have a favorite way to incorporate nature into your child's art activities? 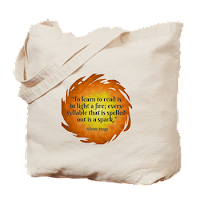 Check out more great items like this at our shop!